For this project, I replaced the rear door speakers with coaxial speakers to get a bit more dynamic range. 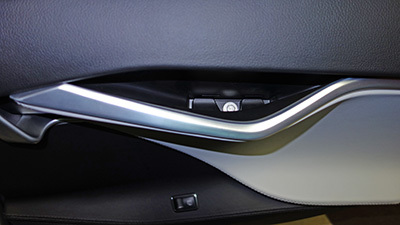 The rear door speakers are identical for all cars, but Ultra High Fidelity (previously called Sound Studio) adds two 3″ speakers on the hatch to improve the high-end, so it may be less important for a car equipped with Ultra High Fidelity sound. This project results in no visible interior changes, makes no new holes in the car or wiring changes, and while the old speakers are removed, they are easily reinstalled. Estimated effort is about 90-120 minutes per door, depending on your expertise. I was unable to locate an identical speaker replacement, both in size or impedance, but the Focal 165 CA1 came fairly close, and was chosen for this project. There is limited room behind the speaker, so any speaker beyond about 2-5/8″ depth may not fit. While 2 ohm impedance is preferred, use of 4 ohm speakers will reduce the volume by about 3 db (a small amount). The impedance is less important if you are adding separate amplification. You can jump to my conclusions at the end to see if this is worth undertaking this change for your car. I’ve assumed the non-Ultra sound is about 25 W RMS per channel. Tesla rates the system at 200 W for 4 channels, but since they don’t include RMS, it’s likely this is a peak power specification or 100 W RMS. Even if you have Ultra High Fidelity sound, which is 580 W, if they power the 7.1 channels equally, we look at something like 36 W RMS per channel, so these speakers should be fine in all cases. The door is fairly easy to remove and with practice can be done in about 5 minutes if the tools are handy. First remove the black rubber pad at the bottom of the hand-hold. It should pry out using a plastic tool. Remove the bolt hidden behind the rubber pad. Behind the inside door release lever is a hard, black plastic cover. With the lever in its maximum open position, pry this part out from the front. It should come out easily. Remove the two bolts behind this cover. 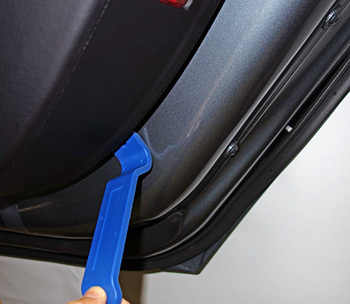 Using a plastic pry tool at the bottom of the door panel, pry out the panel from the doors. Avoid using anything metal to prevent scraping the paint. There are a number of snaps (that make a bad sound when releasing), around the outsides of the door. I found once you get a few to release on the bottom, you can get your hands between the metal door and the door panel and pull out. There are about 6 very hard snaps at the top. Pulling the top away from the door will release them. There are wires attached between the door and the door panel, so don’t pull so hard as to rip out the wires! With the panel loose, unclip all the electrical connectors. Most of these have a latch that must be depressed to allow it to release. Do not force! With the panel detached, I put it in a safe place where it wouldn’t get dirty or scratched. On the door the Tesla speaker is visible. Unclip the connector at the top of the speaker. 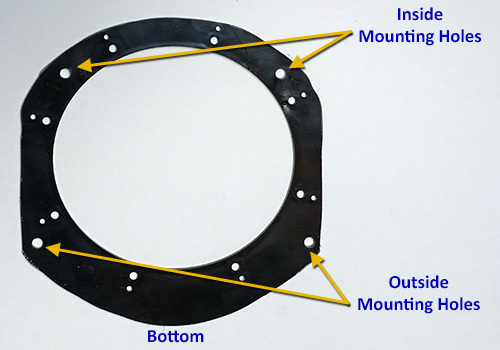 There are two sides that must be spread out to release the connector. Remove the four torx T-25 screws around the outside of the speaker mount, and remove the speaker. The universal installation kit has the parts you’ll need to make a mount. It’s not perfect, but with some adjustments will work. There are three rings. We’ll only use the two angled rings, adjusted so they have the maximum angle. You may want to get a feel of how these all go together and mount to the flat plate. The flat plate needs to be cut so it’s about the same size as the original Tesla speaker’s mounting and four holes drilled for the mounting. Use the Tesla speaker to make a paper template to see where to cut. Be sure the mounting holes for the Tesla speaker do not overlap existing holes. Check how it will all go together carefully BEFORE cutting to be sure it will work. Remember the rings are positioned so the thin part is at the top and the bottom sticks out more than the top. As you start to see how this all will fit together, you’ll discover you can’t get the four holes to all reside outside the speaker rings. The solution has the bottom two holes on the outside the ring, similar to the Tesla original, and two holes are inside. My first round had had the mounting holes 1/4″ too low. The upper holes need to reside right under the ring (at a point where you can’t screw them in. I then made the top two holes as slots (not shown), so when mounted you can put the top screws in snug, but not super tight, and then slide the plate down so the screws are under the ring, then put the bottom screws in. You’ll also need to file some slots in the ring so the top two screw heads fit without binding once you slide it down when mounted. 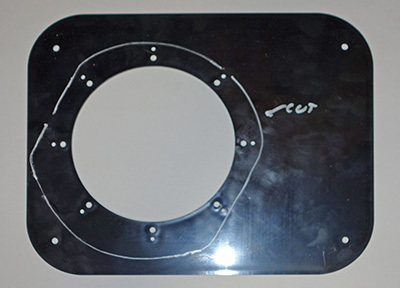 With the plate made, attach ONLY the lower angled ring to the base plate. Attach the speaker to the upper angled ring. For me, the speed clips in the package only worked on two of the four holes. I had to use some machine screws and small nuts with lock-washers to attach the other two screws. Later we will install the base plate to the door without the speaker and top ring. The 3 screws to hold the speaker/upper ring to the lower ring is installed last. Dry-fit everything together and see that it fits the speaker opening and the holes all align up. The bottom of the speaker will stick out the furthest, similar to the Tesla speaker. Optional – I cut out some speaker damping material to match the size of the base plate, avoiding covering the mounting holes and speaker hole. Remove the adhesive backing and attached it to the bottom of the plate. A better seal between the door and the back of the speaker should improve the bass slightly and may reduce the chance of rattles. If you examine the original Tesla speaker, you’ll see that they put felt on its mounting plate. 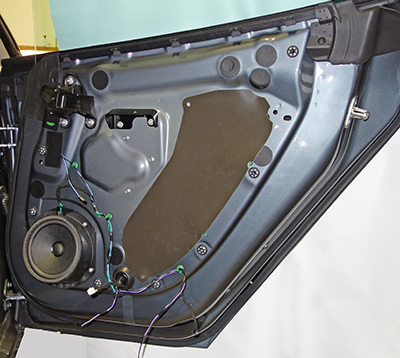 Attach the speaker plate to the door with the four torx screws from the Tesla speaker, but feed the wires under the mount up near the original speaker connector so about 6″ remains on each side of the mount. Attach the wires to the speaker. I used some solderless terminals, but you can solder the wires if you prefer. Note the positive and negative markings and make sure you connect the wires to keep the polarity correct. For example, connect a red wire to the plus terminal, and a black wire to the negative terminal. With the wires attached, mount the speaker/top-ring assembly with the three screws. The top-most screw may be too long, so you may have to find a slightly shorter screw so it doesn’t touch the metal in the door. As you close it up, be sure the wires are not going to interfere with the window operation. Attach the wires from the speaker to the connector. The green/black wire is the negative, and green is the positive (right door side, left side is purple/black and purple). With quite a bit of searching I was unable to locate a mate to this connector. Depending on what you have handy, you might be able to make a male connector, or cut the Tesla connector and connect the wires up directly. Test that the speaker is working correctly. An inverse of the removal, connect all the wires from the door panel and start at the top and press in the snaps. Check that the white serrated snaps are poking into the receptacles (sometimes they miss, making it impossible to secure the door). Proceed around the door, pushing in all the snaps. Screw in the three bolts and return the rubber pad and plastic insert. Here’s a plot of the audio with the before and after results. Tests were at the lowest level “9” volume, tone controls at zero, and 100% of the sound coming only from the speaker under test. All test sounds were generated from an Alan Parsons Test CD, transferred to lossless FLAC files on a USB flash drive. All windows were closed, HVAC off and it was quiet outside when the testing was done. The test car also does not have the pano roof, which should reduce some sound reflections. The microphone was placed above the center-back of the arm-rests (not ideal, but adequate). The matching peaks and dips are more likely due to resonance in the car at specific frequencies and not the speakers. The relative differences are more interesting. For a car without Ultra High Fidelity sound, this is an incremental improvement that may not be worth it to everyone. It does improve the sound for the back-seat passengers. After a bit more critical listening (in the front seat) and the fader set a little more to the back, I’m finding the overall sound is better. I’m now happy I did the project and the sound seems more balanced. The bottom end bass is still lacking. 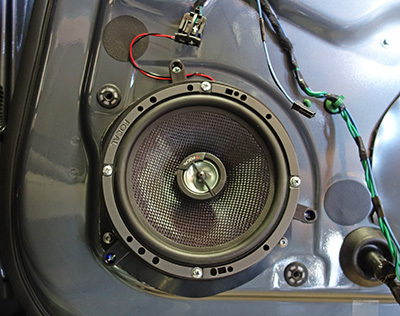 See our Sub-woofer and Amplifier Installation project to further improve the sound! Please excuse me as I am new to the forum. Is there a reason why you did not upgrade the front speakers as well? Also, looking back, would you just add an amp ( to power the front and rear speakers) and other components but leave the existing speakers to improve sound quality vs upgrade the existing speakers to aftermarket coaxial speakers? I was thinking if there was a similar scenario such as my 2014 bmw where it was not ideal to just upgrade the front and rear speakers but add and amp and configure the eq to have better sound rather than upgrade the speakers only would only have very minor improvements. Welcome! The front speakers include separate mid-range and tweeters and provides a good soundstage. The rear speakers (without UHFS) only has the two 6.5″ rear door speakers, which really limits the frequency response to the rear passengers. 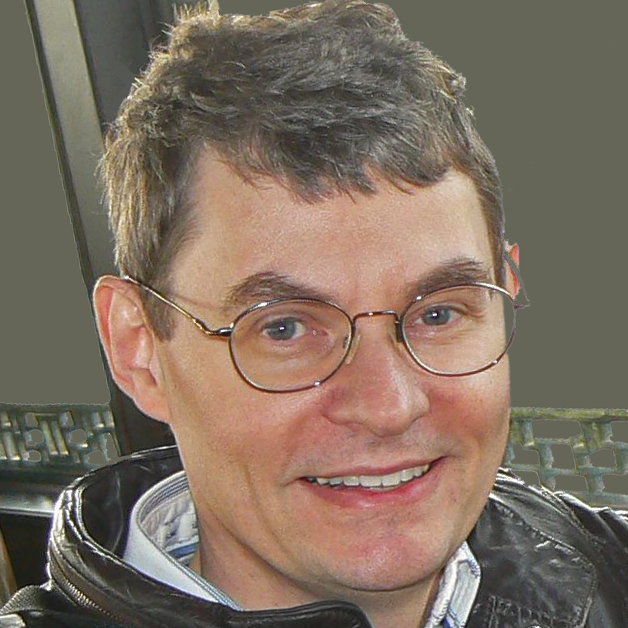 There is no limit to what you can add if budget, complexity are not concerns. I was going for the most bank for your buck, as upgrading the front speakers is not going to provide nearly as much benefit. Amplification is a different story and if you feel you need more volume, then an additional amplifier may be warranted. We added an amp for our subwoofer project. Is there any reason that you can think of that this speaker kit would not work for the front door speaker? The standard stereo has the same driver in the front and rear door. I’m not 100% sure if the holes in the bracket where it attaches to the front door are in the same spot, but it seems that would accounted for when you template the flat piece of ABS. Yes it should work, but I think the mounting is different. The front door can accommodate both the 6.5″ and 8″ speakers, where the rear doors can only handle the 6.5″ speaker. Be sure to check before cutting up the mount for the front door. You mentioned you looked around but were not able to find a mating connector to plug into the existing Tesla speaker connector on the door panel. I was wondering if you ever found the mating connector after this article was written? I plan on following your guide to upgrade my speakers and the only thing that I am unsure about is how you plugged your speaker wires into the Tesla connector without using a matching mating connector. Sorry, I never found the connector. I made one with a two pin header on .1″ centers. Ok thanks. Male or Female? Any specific part number from website/store or just something you had sitting around your workbench? I used something laying around. I think it was a male 2 pin header, but it was over two years ago, so I may be wrong. I compared standard vs “ultra” prior to ordering, and I didn’t think it was $2500 better. I believe I can build a better than “ultra” system for less than $2500. I was looking at Focal component speakers as a replacement for the standard audio system in my 2015 MS 85D. Bass performance in the speakers is inconsequential because I ordered a JL Audio PowerWedge + powered amp (400W RMS @ 0.25 ohm). You replaced a component mid bass driver with a full range coaxial combo. Did you remove the component tweeters in the A pillars, or simply disconnect them at the crossover? Would microphone placement explain any of the difference in frequency response? Where was the microphone that measured the frequency response? If at ear level, if anything the Focal’s tweeter is doing a fantastic job since it’s way off-axis to ear level. Thanks for all these articles! Just realized this is the rear door, which ONLY has a mid bass driver, no tweeter. Does that explain the poor high frequency response of the Focal coaxial speakers? because it’s just the mid bass signal from the Tesla amp? Or does the amp send the full spectrum signal and the mid bass driver performs its own lowpass filtering because of its natural high frequency response rolloff? Perhaps you misread the frequency response charts. The Focal improves the high-end frequency response over the stock rear door speakers and do sound better. As to why it still has a rolloff, I only measured the final audio result. 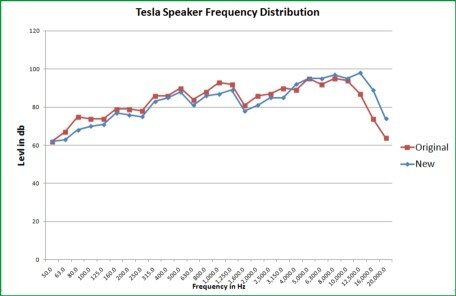 This is likely due to car acoustics, the speaker, and perhaps the Tesla amps. Measurement was done with the mike pointed forward at the center armrest rather than at the speaker. It was done to get consistent results at the center of the car, rather than pointed directly at the speaker. If the mike was positioned in front of the speaker, the response would likely have a higher-end. Let us know how your project turns out! Thanks for the clarification on mike placement. I’m glad it sounds better, which is encouraging to me as I start my project. I should have been clearer. The graph shows the Focals do better than stock, but not as MUCH better as I had expected. While the stock speakers roll off above 10 kHz, the Focals roll off above 12.5 (like a mid bass driver) rather than at 18KHz like I’d expect with a tweeter, hence my question as to whether they are being fed mid bass signal rather than full range signal. But I looked at Focal’s frequency response graphs for their components and they’re down 20 dB by 16 kHz! Which is odd because user reviews complain they’re too bright or harsh. So now I’m just hoping the subwoofer plus some treble tweaking will be enough to get a great sounding system. I’ll check back in after the sub is installed! The loss of bass seem quite significant. Problem is that output in the range of below 200Hz is more energy demanding and going from 4Ohms to 2Ohms actually reduces the effective power utilization of the amplifier also. You can equalize the treble more easily than the bass typically because bass is where the energy is and you end up causing clipping (= distortion) at higher volumes. A subwoofer can fix this of course and I believe then you should have a superior system in every way. Yep – See our Subwoofer and Amplifier Installation project!